Two months after the publication of her modern classic, To Kill a Mockingbird, novelist Harper Lee replied to an inquiry from one Mrs. Hudson. 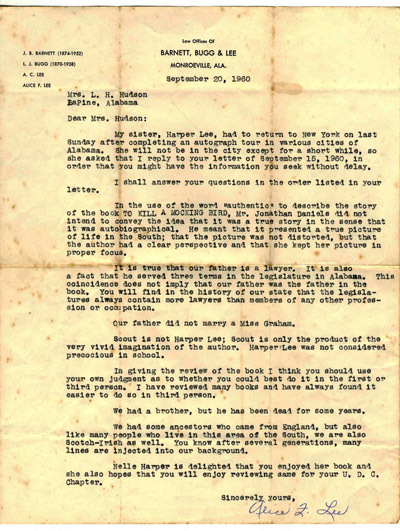 A fellow Alabama resident, Hudson, like many readers, apparently drew parallels between Lee's life and the fictional characters in To Kill a Mockingbird, published in July 1960, and sent Lee questions about the novel's setting. The typed letter, signed in Harper Lee's hand and with a autograph drawing by her, is being offered by Nate D. Sanders Auctions today, November 8, 2011. It is an exceptionally scarce bit of correspondence as Harper Lee quickly grew to loathe any commentary whatsoever upon her only novel. The current online bid is $5,417. 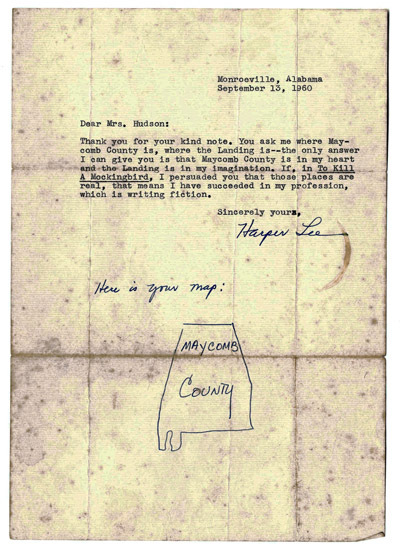 She signs it, "Harper Lee" and provides Hudson with a hand-drawn map of fictional Maycomb County with the inscription, "Here is your map." Astonishingly, the map directly contradicts Lee's written words as it mirrors in both large and small details Monroe County, Alabama, the county in which Monroeville lies. This letter appears to solve the 20th century mystery of just how much Harper Lee drew upon her own experiences in writing To Kill a Mockingbird. The 7" x 10" single page letter with a return address from Lee's home in Monroeville, Alabama, shows moderate foxing and toning along folds. "…Scout is not Harper Lee; Scout is only the product of the very vivid imagination of the author…"
"…the book is very shallow, and gives quite a distorted picture of the South, yet there is something very intriguing about it…"
Forty-one years and 30,000,000 readers after its initial publication it continues to intrigue. Images courtesy of Nate D, Sanders Auctions, with our thanks.